July Cruise 2016- Ilfracombe / Oxwich Bay / Swansea / Weston. Part 4 - Swansea, Kenfig, Nash, Weston. After a failed set off on the thursday on a 9m neap - we delayed the July cruise start to Sunday. Weston Bay thurs afternoon was horendous - blowing 6 onshore with large breaking seas. We just turned around at Brean Down - no time to see if things were possible further out ( too small a tide ) - and going down to Porlock for an anchorage was not on anyway. Went back up to the mooring for the night - decided to go home until Sunday. So - Sunday evening sees us on the river mooring - calm weather forecast. HW in the morning is 0630 - so light at 0500 - we plan to go out at about then. Worried about fog - warm and humid ? Hmm - 0400 - look out at about nothing but white stuff ! 0500 it was a little better - just about see the moorings ad other boats. We go. Once out in the bay we expected it to burn off once sun was up. Saw nothing of brean down - steep holm. Vis about 100m or so - maybe a little more. Ran on my waypoints and took a direct line for Foreland Point. Saw a disc of sun at one point - but no vis. Flat sea - bid tide running - all a bit strange and eerie. The large anchored tanker that loomed out of the mist at one point was worrying - at about 200m ! First sight of land was just after Foreland - a little before Copperas rk - it then lifted to a balmy afternoon with a mooth sea and little wind - and good vis. 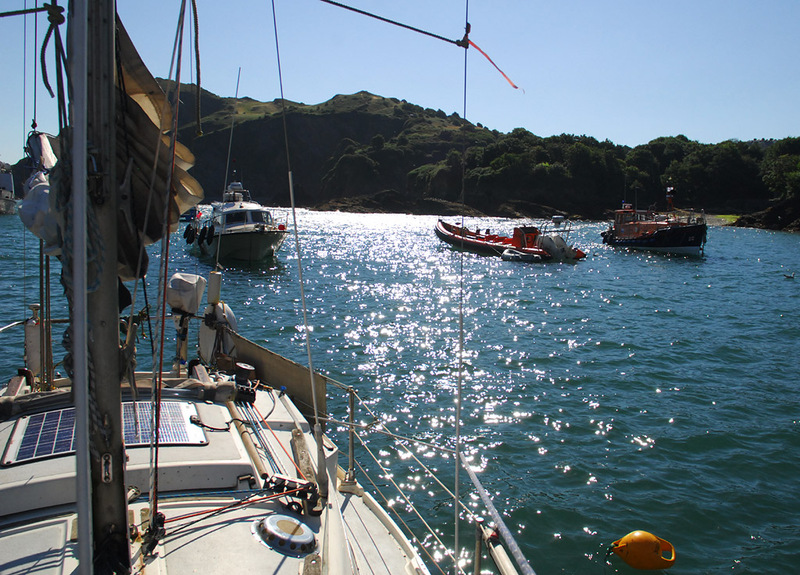 We were going to anchor up at Combe martin - but made such good time to Foreland we were ok for Ilfracombe direct. Just into the first hr of the flood against us. Had to hammer the engine a bit around Rillage - maybe 1.5 kt against us. 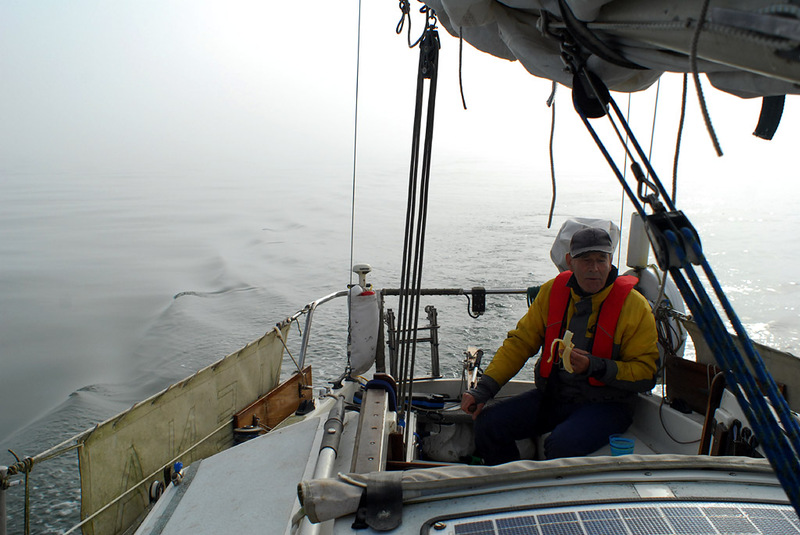 100m or less vis all the way from Weston Bay to past Freland point - 0530 - about 1330 ! Engine running very sweetly now. No issues at all since the head job. 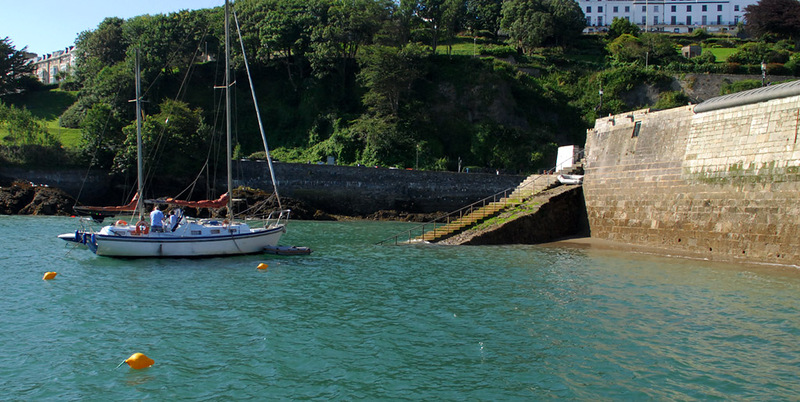 Just hit the outer harbour at Ilfracombe at a depth of 0.9m at the pick up buoy, Went aground right next to it ! Goood timing. A good evening of HW, dingy paddling, fish and chips - skowers at the yacht club etc. Glorious day - so scrubbed bottom ( badly needed ) checked zinc. Changed prop zinc. All ready to antifoul if weather permitted on the Wed.
No such luck - always knew wed was a 'blip' day - small warm/cold frontal system whipping through.Rained of so generlaly mooched aorund Ilf sightseeing. Tempted to go out for an hr in the evening but got lazy ! Ilfracombe outer harbour is really a gem if a little lumpy when there is some swell. Marinas cut you off from the sea conditions generally - not so here !